The Three-Bishoprics province was created following the Treaty of Münster (1648) ending the Thirty Years’ War. The Holy Roman Empire and the Duke of Lorraine abandoned their rights on the bishoprics and the towns. Since the 11th cent. the Bishops of Metz, Toul and Verdun had taken advantage of the divisions in Lotharingie in order to obtain special privileges and by placing themselves under the protection of the French kings. Even though the dukedom of Lorraine claimed its very strong relations with the Holy Roman German Empire, the three Bishoprics wanted to be considered as a French region within the German empire, including in linguistic terms. For the Holy Empire just like for France, the control of these bishoprics was of essential political importance. During his famous ride into Austrasie in 1552 Henri II managed to deploy his troops in the bishoprics with the support of German Lutheran princes. Against the will of the Dukes of Lorraine, who overtook and lost several times Toul and Verdun, where they succeeded in controlling the worldly possessions of the bishops until the arrival of Henri IV. Henri IV submitted the bishops to the oath of loyalty, he confirmed the legal primacy of the French Kingdom at the expense of the German Empire : protected towns became submitted towns. Louis XIII opened a parliament in Metz (1663), the seal of the town was taken away and he imposed the salt tax to be paid in the bishoprics. Because the Parliament was in conflict with the general governor of the Three Bishoprics, the Parliament was “relocated” to Toul from 1637 to 1658 where the magistrates served during almost 20 years. 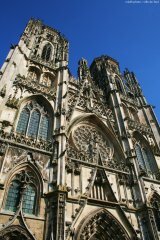 After the creation of the province, a governor and a senior commissariat officer were appointed in Metz and Louis XIV is allowed to name the bishops. Through the policy of meetings (where the bishops impose their vassals the oath of loyalty to the French king), the king extended his influence in Lorraine. The Treaty of Westphalia confirms the royal sovereignty in the Three Bishoprics. In the 18th cent. the incorporation of Lorraine into the French kingdom became a prosperous period for the new province. The embellishments accomplished under commandant Belle-Isle bear witness to this period. The Three Bishoprics, originally French in German territory, became a province under the centralized monarchy of Louis XIV.